It is raining. I have a weather-induced headache. My son told me he hates me this morning (motherhood is all sunshine and roses, isn’t it?). And I am in a funk. I did not, however, succumb to the fresh cinnamon rolls and Berger cookies (Google it and thank me tomorrow) at the grocery store, where I went after dropping the kids at school. Warm smells wafting over the bakery, you have nothing over me. 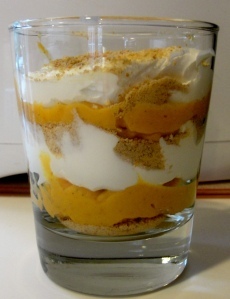 Because I have guilt-free pumpkin parfait to look forward to. The cookbook (Not Your Mother’s Slow Cooker Cookbook, by Beth Hensperger and Julie Kaufmann) called these fajitas, and I guess they probably are. But I have to listen to howls of protest when I say fajitas and none when I pull out the hard shells and call them tacos, so they’re tacos. My ears are happier. We liked these, but I have to tell you I was disappointed in the texture. I’m new at this whole steak thing and even newer at beef-in-the-Crockpot, but the meat fell apart when I pulled it out of the crock, so slicing against the grain (which is what the cookbook said to do) was pretty well impossible. They taste wonderful, don’t get me wrong. It just wasn’t quite what I was expecting, which probably says more about my inexperience in this area than the recipe. We served these in hard-shell tacos (and thus, they’re marked gluten-free) with guacamole, cheese, and salsa. I had mine as a salad, which was quite good. The family seemed happy enough and truth be told, I was too tired by last night to drill through “how’s your dinner,” which I usually ask, so I took silence as an endorsement and let it slide. I also forgot to take a photo and apologize for that. In a bowl, combine everything up to the steak and stir well. Spray your slow cooker with nonstick spray. Lay your steak inside, pour the sauce over it, and lay the peppers and onions on top of that–don’t mix them in. Cover and cook on low 6 – 8 hours. Remove veggies from the pot (I served them on top of our tacos). Lift out the meat and let it be for about 10 minutes, then slice (as best you can) against the grain. Serve. I’m. Not. Eating. Followed by a shove to the plate towards the center of the table (or the floor, depending on the night and the mood). Contrary to what the Perfect People say, it happens to all of us. Every single parent who has ever taken the time to plan and shop for a meal and then cook it (and clean up afterwards) has had those phrases spring from their beloved children’s mouths. And every single one of us has felt a heart-sinking sensation and the instinct to bury said child’s nose in the middle of the supposedly inedible entree to force them to eat for the love of all that’s holy. Just. Eat. It happened here last night. I’d heard a ton about the Pioneer Woman’s chicken spaghetti over on Pinterest and I gritted my teeth and went against everything I love about cooking and stirred together cream of mushroom soup (Healthy Request, but still) and cheese and noodles, and then glopped it into a casserole dish and baked it and let it sit, and then scooped it into bowls before presenting it to my kids with a cheerful, “Everybody loves this!” Because everybody does love that recipe and there are worse things in the world than occasionally breaking one’s rules about cream of ick out of a can so you can serve your kids a kid-friendly bowl of soft noodles in grey sauce that they’re supposed to love, yes? They tried it–I’ll give them that. DS took a bite, grimaced, looked at me, and gamely ate his portion, bribed maybe just a tiny bit with the promise of chocolate afterwards. I’m already breaking the rules, here. Might as well pull out all the stops. DD took her bite, stuck out her tongue and “blech”ed, shoved her bowl to the center of the table (my personal favorite move), crossed her arms, and said she would. not. eat. But even if she hadn’t, know what? She is not going to starve herself into malnutrition in one night. She is not even going to starve herself in a week. And I have neither the time nor the budget (nor the patience) to make her something else just because she’s feeling like not liking a dinner. I’m not completely heartless. My kids don’t like spicy food–it’s an honest dislike–and I do accommodate that with simple alternations or options when DH and I enjoy a meal with a little kick to it. My son honestly doesn’t like mac n cheese (I KNOW!) and I don’t ever expect him to choke it down just because I felt like making some. My daughter truly didn’t like baby food, and so we skipped it and went right to real food that I chopped up into dollhouse-sized bits. But these little snits where they don’t want to try something new or protest because the food on the table doesn’t fall into the “favorite dishes” category? I’m just not playing. I adopted this attitude a year ago, and while they still do complain and I still hear about who doesn’t like what for this reason or that, they eat. Every night. Nobody yells, nobody scrambles to “fix” it, and nobody starves to death. So that’s my house. What works for you all? 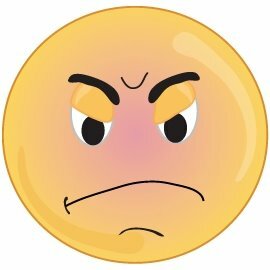 How do you handle “I hate it?” Post it in the comments and let me know! My kids have a teensy bit of a chicken fingers (nuggets, tenders, whatever) obsession. I’ll be honest with you–I don’t get it. We eat a lot of chicken around here, and they’ve been to enough restaurants to understand that there’s not usually a toy lurking under the napkin (and we eat fast food about three or four times a year, max), so it’s not a bribery thing. Maybe it’s the complete lack of fried chicken in their worlds–I grew up eating Kentucky Fried once a week or so at my grandmother’s house and am kind of permanently fried-poultried out as a result. Anyway, the first thing they generally want to order when we eat out is chicken fingers, and one of my dear friends is a hero in their eyes because she almost aways has them on the table when we dine with her family. Try as I might, I just can’t bring myself to buy the nuggets in my grocery store freezer. Have you ever read the labels on those things? Y’all, I can’t pronounce half that stuff, much less explain what it’s all doing in a bag of chicken. We don’t really fry around here (nothing against it, but it trashes my stove with grease and that breaks my heart; I really love my stove), and the usual bread-and-bake recipes are both lacking in the crunch department and, to be honest, not very tasty. Panko are Japanese-style bread crumbs. They’re much larger and dryer than regular bread crumbs, which translates into lots of crunch even when you use less (which you generally will), and thankfully, are starting to appear on the shelf right next to their more ordinary brothers and sisters, even in my sad excuse of a Soviet-esque grocery store. I threw this together over the weekend on a whim, after thinking a bit about my garlic bread spice mix and wondering how those same flavors (which are yummy!) might translate to chicken. The answer? Cleaned plates without my hounding the short people to just eat already. Success. This technique, by the way, would be equally great on fish; I plan to try it on some rockfish later this week and think baked fish sticks will be just as popular as these chicken fingers were. Amounts are approximate, as I was literally tossing together this and that; taste the mixture on your fingertip until it seems good to you. Last hint: Cut the chicken across the grain (cut the breasts across the short side instead of down the long side) for the most tender fingers out of the oven. Cutting through all those fibers makes for some soft, yummy meat inside its crunchy crust. Heat your oven to 350 degrees and either line a cookie sheet with parchment paper (yes, I said parchment paper–it doesn’t stick) or spray it with nonstick spray. Toss together your Panko, garlic powder, paprika, and salt in a bowl with a fork. Arrange your workspace in an assembly line: chicken, egg, breadcrumb mixture, cookie sheet. 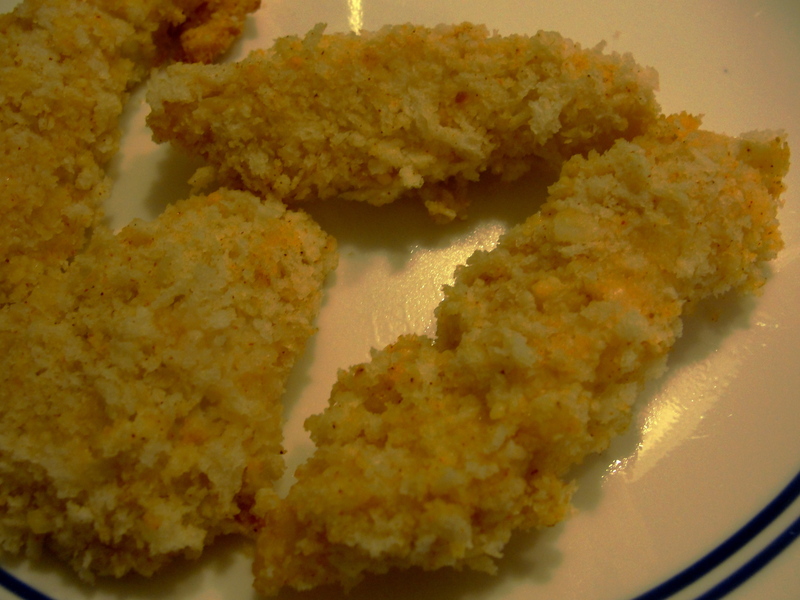 Note: I used two chicken breasts because this does not reheat well–the crumbs lose their crunch. Adjust up or down as needed, but I don’t recommend making more of these than you’ll eat in one sitting. My knee grew a purple baseball last night. My knee grew a purple baseball because my Taekwondo class sparred last night, and while my classmates delivered carefully calculated kicks and punches, I flailed around like a purple dinosaur and got nailed in the kneecap (which is, by the way, one of the only bits of my body that peeks out from what feels like miles of padding…figures.). The women who nailed my knee was decidedly not taking it easy on me, and it hurt. A lot. There was a second after that kick when I took my arms out of guard-up position, sucked in on my mouthguard, stepped back, and almost quit the match. Because I’m 40-something years old and I have a family and a career and a mortgage and a dorky old mom-car and absolutely no real business practicing martial arts with other people once a week. Stepping off to the side to pout and nurse my poor knee and unpeel my sweaty self from my body-suffocating vinyl gear sounded awfully good, and in a previous version of myself, that’s exactly what I would have done. Instead, I pull-step-kicked and hopped forward. I kicked the air, mind you, but I got back in there. No match points as my opponent easily dodged away, but yay for me. It was a victory. I tell you this because I get an email or two a week from you guys (who both read my blog and let me know about it–God love every one of you, I swear) telling me that you can’t cook. It’s a valid feeling and I respect it. Only…you can. Taekwondo was something my son wanted to do, but he was afraid to go by himself. Afraid to be the only one making mistakes. So I signed up, thinking I’d take a few classes while he built his confidence, and then leave him to it while I sat in the back of the room with my Kindle. And now look–two years in, I’m working on my blue belt and I’m pretty sure it’s more my thing than his. It’s easy to ignore the burners in the kitchen. I know. You have so many options, from frozen foods to take-out to PB&J to cereal, that let you eat without figuring out ingredients or braving a flame. It’s intimidating to put perfectly good food into a screaming hot pan. What if it burns? What if I measure wrong? What if nobody likes it? Have I told you about the first time I tried to make garlic potatoes? I was, what, 22 years old or something, living on my own for the first time, and I got my courage up and bought garlic and potatoes and butter and salt, just like my Five Ingredients Or Less cookbook told me to. And I thought something was odd about the papery covering that seemed cemented to the cloves, but the cookbook never actually said to peel them, and that was clearly an impossible task anyway. So the garlic and the potatoes and the salt and the butter went into the oven and came out, and guess what? It was inedible. Have you ever tried eating garlic skin? I quit. Right then and there. Ramen noodles and mac and cheese out of the blue box and tuna sandwiches were just fine, thankyouverymuch, and I couldn’t cook. Some years later, I made enough money to pay for cable TV and Rachael Ray showed me how to crush garlic with a knife to get the skin off, and I went to the store and bought potatoes and garlic and butter and salt, and I made myself that damned recipe, and it was delicious. And I did it. You know the rest. Cooking is my hobby and my zen. I think about it nearly all the time–what ingredients might work together, how that saute technique might translate to this other dinner I like, how I can get my paws on that awesome new electric toy for my countertop. I still mess up recipes. I still make things my family won’t touch. I still learn, because there’s always so much to learn. I go back to Taekwondo every week because my kids (who are in my class) expect me to. It’s a fantastic physical release. I’m getting stronger. I’m feeling more confident. I could defend myself if I needed to, which is very empowering all by itself. I know I really stink at sparring and my classmates know it and I feel like a moron every Thursday night by the end of class, and now I have this purple ball on my knee which is oh-so-attractive and comfy. But I am going to learn it. I refuse to give up. I will do this. It’s the same in the kitchen. Give yourself some room to screw up. Improvise a little bit. Accept that even Julia Child herself had to take classes (and she was well into her 30s before she started cooking!). You can do this, and it really is fun, I promise. Decide to rock it and you will. Keep cooking, gang. Thank you so much for the emails. Have a great weekend. Fly-by today, gang–it’s one of those mornings. This came from reading a bunch of recipes that had too much stuff in them I didn’t want, and then making up my own. 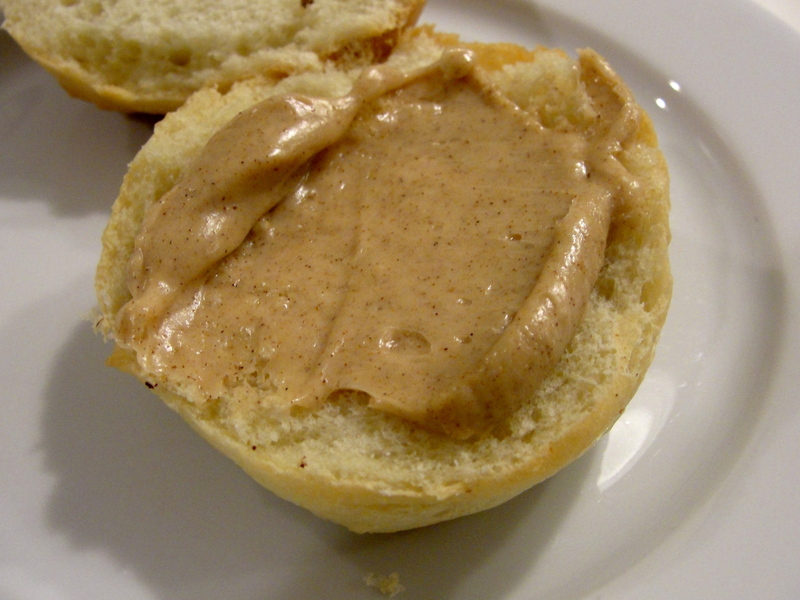 It’s simple and quick and delicious and perfect for our hurricane days. I may have to make it again today. Heat a large skillet over a medium flame. Swirl the oil over the pan and then add the onions. Cook them until they start to soften (not brown, but soften), and then stir in the garlic. Keep it moving for a minute, until you start to smell the garlic (it’ll burn and bitter if you let it sit still). Stir in the ground beef, crumbling it up as you add it in, and cook until that browns. Remove the pan from the heat and drain off the fat. Coat your slow cooker with nonstick spray or more olive oil, and then stir together all the ingredients in it. Cook on low 4-8 hours. Adjust seasoning before you serve, as they can get pretty mild in the Crockpot. 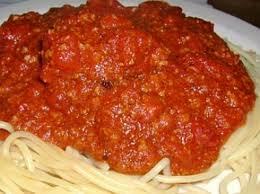 (If you like your sauce sweet, stir in a tablespoon or two of sugar halfway through the cooking. If you like it rich and restaurant-like, stir in a tablespoon of butter right before you serve it and let it melt throughout the sauce.) Serve over noodles with Parmesan cheese.